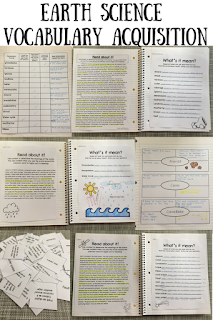 Content vocabulary is extremely important for students to understand. I find that this is especially true for subjects like science and social studies. 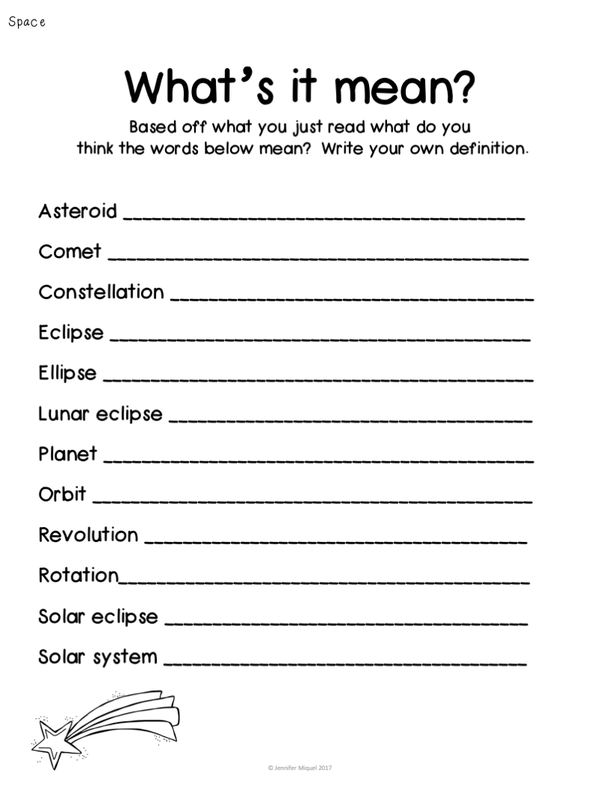 When I introduce a new science topic I always start with the vocabulary. 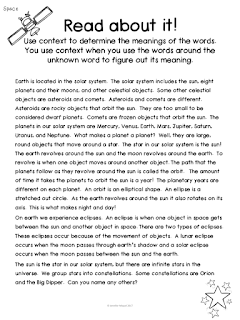 Below is an example from my Earth Science Vocabulary Acquisition pack and how I use it in my classroom. I have the students fill out a table on their familiarity with the words for the topic. This is a working document that we revisit throughout the study. 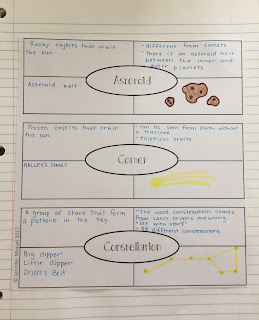 Students will add snippets about what they have learned. I like doing this because it really makes students think about how familiar they are with the words. 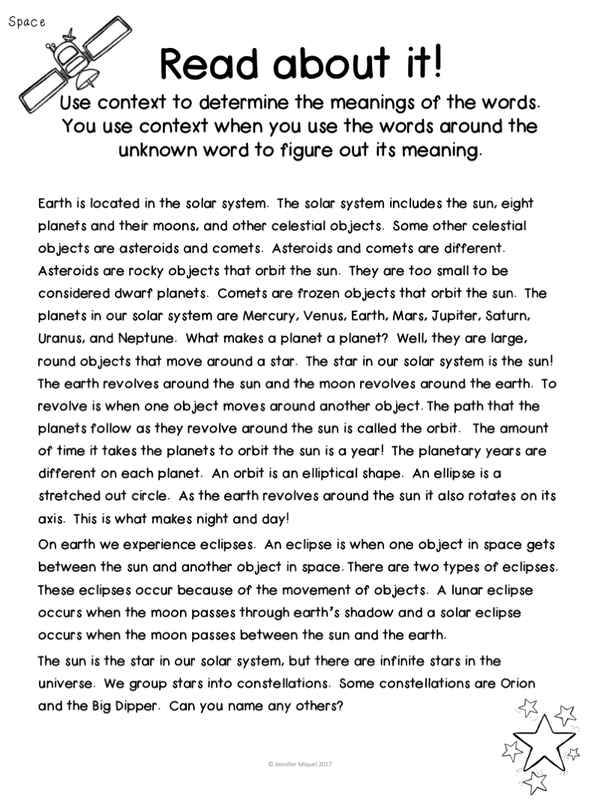 The next thing I do is have students read these vocabulary words in context and write their OWN definitions. This helps our students own these words. 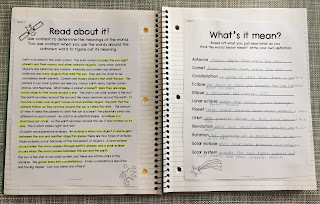 A typical spread in their notebook looks like the pages below. Below is a close up of these pages. After the students complete their work on vocabulary in context we spend some time reviewing the definitions. 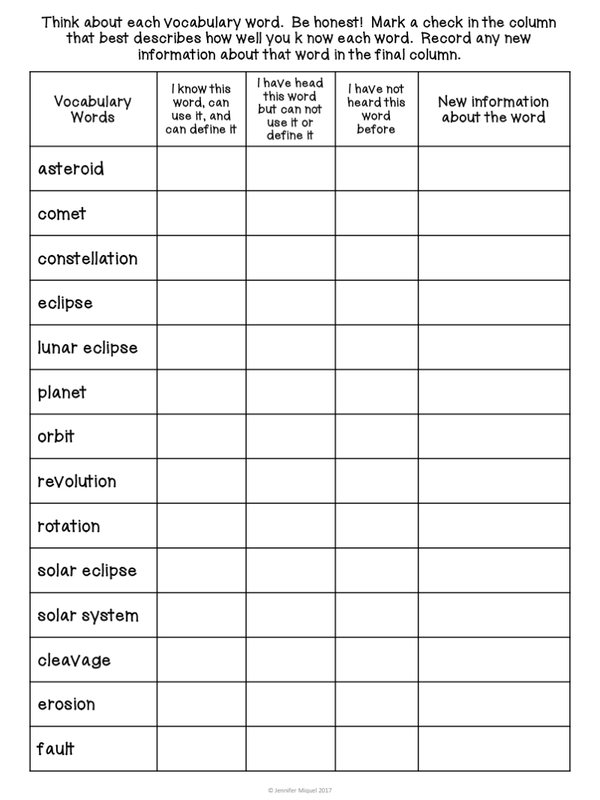 Then the students will use their definitions to create word squares for the vocabulary. In the center they will write the word. In the top left corner students will write the definition. 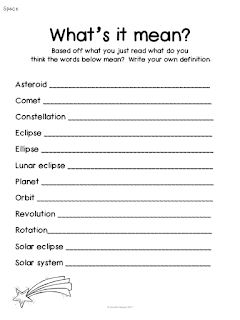 In the top right corner students will write characteristics or facts about the word. In the bottom left corner write examples of the word and in the bottom right corner write non-examples or draw a picture of the word. Their notebooks will look like this. 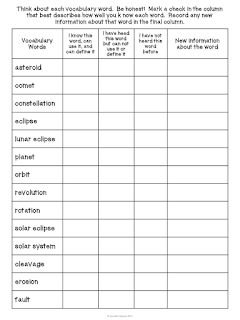 I also create vocabulary cards for the students to use at home while studying or for whole class review. Sometimes we will use these to play vocabulary Bingo which is usually a huge hit with my students! 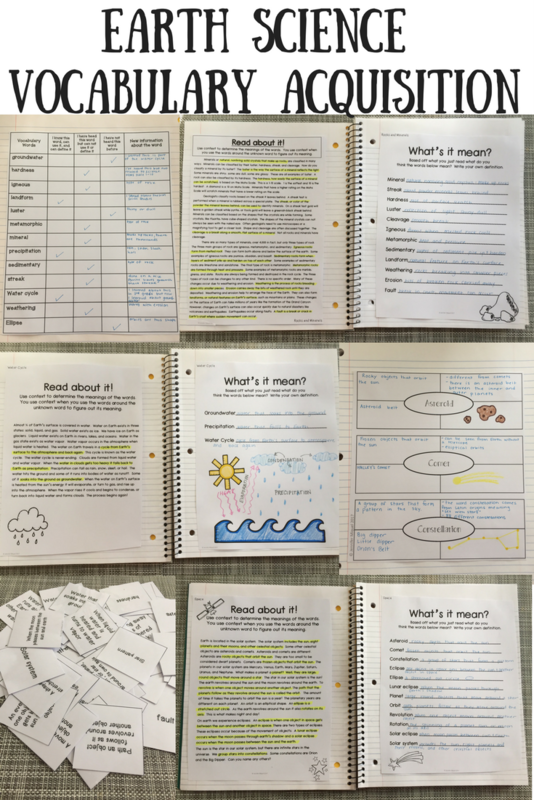 Yes, this is a ton of work on vocabulary alone, but by the time we are finished with it my students have a superior understanding for the words and their meanings. In addition, they also understand the topics better as a whole. 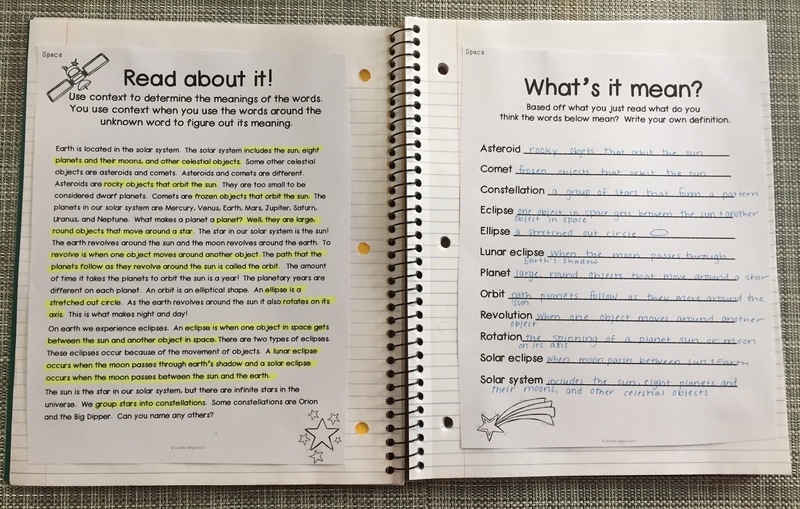 Click below to be taken to my product page on TpT to see all that is included in my Earth Science Vocabulary Acquisition pack!